Lancashire Heeler Booth Discover Dogs November 2007 Sean Stevens with impeccably behaved Lancashire Heelers. At Crufts and at Discover Dogs each Breed Club runs one of the 'Breed booths' which introduces the general public to every dog on the breed register of the Kennel Club. The Lancashire Heeler Club runs one of these booths and I am ready to enrol owners and their dogs for Crufts to meet the general public. 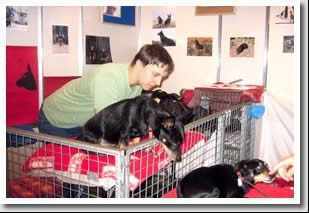 The dogs do not need to be show quality but they do have to have 100% good temperament, must not mind meeting all age groups, including babies and should not be phased by wheelchairs. 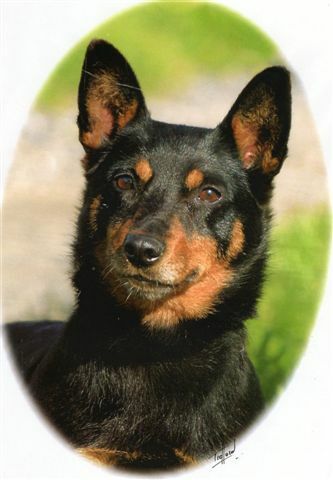 Lancashire Heelers are very popular as they are very lively and are always pleased to see everybody. 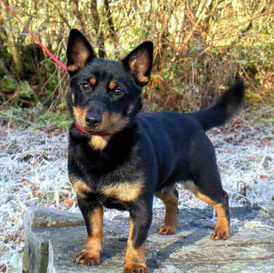 The owners must have a realistic attitude to Lancashire Heelers and realise that they are not suitable for everyone! The general public are not interested in championship certificates and only interested in dogs that are suitable for their circumstances. A good breeder takes temperament, health and the more usual characteristics into account and , of course, the champions and show specimens in our breed have demonstrated they have the whole package and do a wonderful job in showing our breed to the general public on a regular basis. I would like to thank everyone for photographs for our booth at the Discover Dogs stand and as I continually upgrade the photographs I am always ready for more! 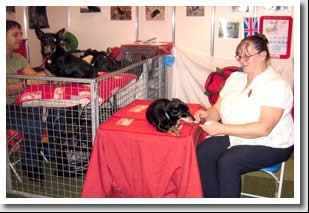 The pictures shown are of Kris and Sean at the Lancashire Heeler Booth, Discover Dogs in November 2007. In these side panels are pics of dogs who are no longer shown, hope you enjoy seeing these oldies.